Alcan front springs 4" lift with center pins move forward a 1.5" Alcan rear springs 56" long 4" lift with spring mounts moved forward, Extended steel braided brake lines, All-Pro Off road's ,Crossover steering kit, Nurf bars, Rear bumper, front shock hoops, U-Bolt flip kit front and rear, Rancho 9000s front/ Doetsch tech pre-runner rear shocks, Front vented brake rotors and large rear late model drums , 3"body lift, ARB air lockers front and rear, Thomas air compressor to run lockers and fill tires, Fire extinguisher air tank Marlin Crawler #330 dual transfer case, 40 channel Uniden CB , Bearcat scanner, Firestik antenna, Porsche 914 seats, American Racing 12"x 15" rims, 33"x 15.50"x15" Super Swampers TSL/SX . 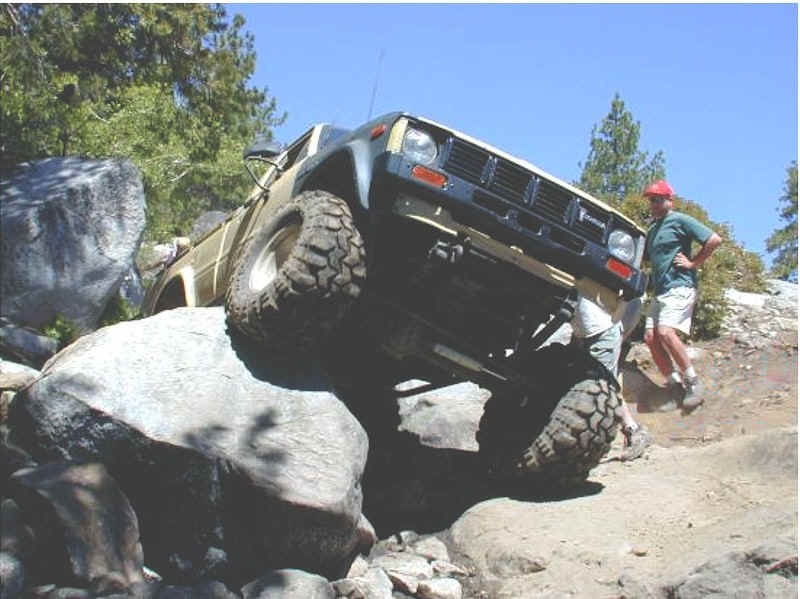 This Toyota 4x4 site is owned by Meres McCarrolll. Want to join the Toyota 4x4 Web Ring?